In the mid-1860s, a near-microscopic yellow insect, the grape phylloxera, invaded the South of France and began killing the native vines, the Cabernets, Chardonnays, Syrahs, and all their kin. Within fifty years the invasion had spread throughout Europe and had jumped the oceans to Africa, South America, Australia, and California, laying waste to vineyards wherever it landed. It was a biological disaster of worldwide proportions, a disaster that ruined national economies, destroyed agricultural systems, and destabilized cultures, causing massive migrations of peoples to fan out over the face of the globe, bringing social and political change wherever they went. Although bits and pieces of this tale have been told, much remains unchronicled and many lessons unlearned. In the story that follows, I attempt to describe in detail several crucial aspects of the phylloxera disaster for the first time, and along the way to reveal-often in a near day-to-day fashion-the lives of some of the major players who successfully fought the battle against the invading devastator of vines. Three major foci emerge from the story. First, the phylloxera case is the original and best model for studying the dynamics of the interaction between human beings and an invasive species as it colonizes a new habitat. Careful attention to the events of the phylloxera invasion can direct our attention to currently unfolding invasive phenomena. Second, the French response to the phylloxera invasion provides the original model for the genesis and development of one important type of Big Science, that powerful synergistic force combining government, industry, and research institutions. Study of the mechanisms of the birth, growth, and development of Big Science in phylloxerated nineteenth-century France can teach us much about the nature of Big Science in our own century. Finally, the phylloxera case exemplifies important issues in the history, philosophy, and sociology of science, providing data for controversies that grip these disciplines in their conflicting claims over how science actually works. As we shall see, our battle with phylloxera today is as alive and important as it was more than a century and a half ago. Yet overarching these three issues is one ultimate, sobering truth: phylloxera is not gone. It is still there-in the soil and in the air-everywhere that it has traveled over the last century and a half. The bug is not-indeed, it cannot be-vanquished. Our struggle with this devastator of vines is never ending, since powering the struggle are the unstoppable forces of evolution. For every defense we muster, the bug ultimately will evolve a successful offense. There is no victory in this struggle, neither for us and our vines, nor for the bug. We must always be alert, especially to the lessons that will be revealed by this book's examination of the past battles. Never again can we let ourselves be lulled into complacency by temporary defensive successes. California's phylloxera disaster of the 1980s and '90s occurred precisely because the defenders got cocky and relaxed their vigilance. If nothing else, this book should show the disastrous consequences of drifting off to sleep in our unending struggle with the bug. Our biological world is globalizing as rapidly as, and more dangerously than, our economic world. Invasive species, imported life forms as varied as animals, plants, bacteria, and viruses, today wreak havoc on indigenous systems at all levels of organization, from wetland communities to agricultural production systems to human social webs. Introduced into new ecologies where they can "make a living," foreign life forms flourish without natural enemies, overwhelming native species, degrading the local ecology, and frequently spreading widely, in the process wiping out whole biological economies. At the moment North America faces invasive threats on many fronts. Examples are ready at hand. Zebra mussels (Dreissena polymorpha), bivalves from Russian freshwater lakes, first appeared in the Great Lakes in 1988. Since that time they have spread into watersheds of the Ohio and Mississippi rivers, and they are expected to continue to infest the eastern United States and Canada. Lacking natural enemies, they have increased in population, threatening not only local wildlife but also many human enterprises, including water filtration systems, power generation, and food sources, as they clog waterways and machinery. Purple loosestrife (Lythrum salicaria), a European perennial flowering plant, has invaded wetlands throughout the Northeast, destroying native plants such as cattails and degrading the entire wetland ecological system. Since they have no competition, an end to loosestrife's spread is not in sight. Dutch elm disease (Ophistoma ulmi), an Asian fungus spread by a beetle, has decimated populations of native American elms throughout the eastern United States, changing the look and feel of the entire countryside and cityscape. Although resistant hybrid elms have recently appeared on the market, there is no telling whether this will ultimately remedy the horrible devastation caused by this invasive species. Here we have only three examples of the destruction caused by invasive species. Unfortunately, these examples could be multiplied many times over, and, what is worse, the dangers are accelerating rapidly. Although many factors are involved in the rise of invasive species, three are particularly important. Global climate change affords new environments for invasive species to colonize. Although past climates might have been hostile to the existence of certain life forms, general warming trends allow the gradual spread northward of warm-climate pests. This is believed to be the mechanism allowing Pierce's disease, a bacterial infection spread by sucking insects such as the glassy-winged sharpshooter, to infect vineyards at ever-higher latitudes. Since the disease is sensitive to cold winter temperatures, as average temperatures rise, the bacterium survives further north. Other examples of temperature-sensitive invasive pests abound. Increasing global transport and travel spread life-forms more quickly and more frequently than ever before. Zebra mussels are thought to have arrived in North America in the ballast-or perhaps on the anchor chains-of cargo ships arriving from Russian waters. It is suspected that commerce brought phylloxera to France. But commerce is not the only vehicle. Tourists today go everywhere, and in the process they transport foreign life-forms both wittingly and unwittingly. An amazing number of critters can live in the bit of mud on the bottom of a trekker's shoe. The relentless focus on monoculture-the planting, raising, and growing of one variety or species of produce or livestock-provides an incredibly soft target for an invasive disease species as well. Current North American corn-growing practices provide a vast "lawn" just waiting for the next invasive blight, against which all those millions of acres of genetically identical corn plants haven't the slightest resistance. In each of these cases, and in myriad others, the social, political, economic, and scientific establishments are called upon to respond. Although all invasive species have the potential to lead to negative effects, some are downright disastrous, as the recent corn blight invasion and the ongoing Dutch elm epidemic illustrate. But none of this is news. A century and a half ago the worst of all known invasive species disasters began in France and, in the end, spread to most of the civilized world. This was the grapevine phylloxera catastrophe, the result of an invasion of a species of sucking insect from North America, which, in dreadful progression, wiped out the cultivated grapevine in Europe, Asia, Africa, South America, and Australia. Millions of people were displaced, national economies were ruined, agricultural systems were destroyed, and scientists, growers, politicians, and ordinary people from all levels of society were thrust into frantic action against the unknown and vicious killer of vines. Phylloxera's invasion of the European vineyard heartland is the first and, until now, the worst instance of intercontinental invasive species. Before the advent of safe, reliable, and speedy transport between North America and Europe, the phylloxera bug could not survive the journey on the many vines and cuttings sent eastward across the Atlantic (Ordish 1972). But once steamships began plying the trade routes, the bug could survive the trip, alight in Europe, and, soon enough, find a marvelously undefended environment in which to make a living at the foot of the European grapevine, destroying untold thousands of kilometers across the continent. The phylloxera case serves as a model for the story of all invasive species battles. Moreover, the phylloxera case didn't happen just once, between 1867 and 1900, in Europe; it happened again, in California, between 1980 and 2000, with a reprise of many of the themes from its first appearance. But the phylloxera story isn't unique. Three stages of the phylloxera story are repeated time and again in the stories of other invasive species. First, denial-"It can't happen here"-is the universal initial stage of invasive species debacles. Watching the growers of Burgundy come up with reasons why the disaster that was ruining the Midi wouldn't-indeed, couldn't-happen to them is no different from watching the denial expressed by growers faced with corn blight, or foresters faced with Japanese beetles, or communities faced with new diseases such as influenza A (H1N1). Denial certainly was the immediate response of Northern California winegrowers when phylloxera was found on some of their vines in 1980. Denial is invariably followed by control efforts such as physical or administrative barriers, cordons sanitaires, or quarantines, which inevitably fail, as they did in every country battling the phylloxera bug. Yet this is the first choice of the authorities in every invasive species case, inevitably to little or no avail, and typically at great cost to some interested community, whether farmers, hunters, foresters, or fishers. Careful examination of the phylloxera dynamic shows that physical barriers are most correctly understood as, at best, buyers of precious time, defensive holding actions to be taken while the real defense is conceived, tested, and deployed. Eradication efforts, such as the use of industrial chemical agents, usually join the efforts at control. Unfortunately, they also inevitably fail. These agents cost too much, require expert application, and have insidious side effects. European experience with CS2, an industrial solvent effective as a pesticide against the phylloxera, conclusively demonstrates the limitations of this approach. We shall see why the industrial chemical approach failed to stop phylloxera, a valuable cautionary tale against such approaches against today's invaders. Each of these three stages appears to a greater or lesser degree whenever invasive species events turn into crises or threaten to become disasters. But the invasive species model provided by phylloxera is not its only relevance. It also reveals to us the origin of an important form of Big Science. A second but equally significant model is provided by the response to the phylloxera crisis: the clearly recognizable birth of Big Science, that powerful amalgam of government, industry, and research universities dedicated to conquering a massive threat to the common wealth. France's effort to beat back and triumph over the devastating bug foreshadows other Big Science efforts such as the Manhattan Project and the Human Genome Project. The methods, structure, and organization that evolved during France's national counterattack on the insect find their counterparts in today's massive efforts. At first the counterattack was a strictly local effort, spearheaded by quasi-autonomous nongovernmental organizations (QUANGOs) such as the Société Centrale d'Agriculture de l'Hérault (SCAH), a group of private citizens-growers, merchants, professionals from medicine, law, and the university, and other interested parties-who had come together years earlier because of their interest in the region's agriculture. The University of Montpellier and the nearby École Agronomique were rapidly drawn into the fray, as were QUANGOs such as the local and regional agricultural expositions. Two reasons for the essentially regional initial response to the danger were the political and cultural remoteness of the Midi from Paris and the total preoccupation of Paris with the disastrous war against Prussia between 1870 and 1872. Only after the war did Paris realize the scale of the calamity unfolding in the south and begin to mobilize in response to the crisis. First, of course, it formed a national committee, based in Paris, composed of scientists, industrialists, and a few private citizens. For the most part the members were highly visible actors from in and around Paris. J.-É. Planchon, the Montpellier botanist and co-discoverer of the bug, plus one or two others from the affected regions were the only exceptions to this general rule. In addition to this administrative action taken by the Ministry of Agriculture, the legislators slowly awakened into action as well, first by offering a large cash prize to anyone who discovered a method of defeating the invader. The amount of the reward was radically increased almost immediately, but the money was never awarded. Soon thereafter the legislators began to pass laws instituting cordons sanitaires, quarantines, and other restrictions on the transport of vine material. Centralized teams were organized to inspect, evaluate, and enforce the restrictions. Local opposition to these teams' activities was widespread and sometimes violent. On the positive side, the government focused on Big Science solutions, especially funding the research and development of insecticidal systems, and then, once a useful product had been found, organizing public-private production and distribution systems, changing laws to allow growers to form syndicates, and then, finally, subsidizing the syndicates to purchase the product. A parallel development was the institution in each of the afflicted départements of a phylloxera commission, or, more formally, the Central Committee for Study and Vigilance of Phylloxera, which met monthly and published or otherwise publicly recorded the record of its meetings. By the time the next invasive pest, American black rot fungus, hit the vineyards, the institutional structure of the commissions, both national and departmental, were onto the problem in very short order. In the end, granting funds to the research institutions, particularly the University of Montpellier and the École Agronomique, provided the most practical-and democratic-solutions. From these and other research centers knowledge about grafting-and, indeed, matériel for the process-were deployed via a widespread teaching effort, concentrated mostly in the workshop model. By 1900 France had an agricultural public-private research structure that was the envy of the industrialized world. Big Science had arrived, and been proved, in the phylloxera crisis. There is much for the historians, philosophers, and sociologists of science to learn from the phylloxera disaster. Three topics stand out: the major role of argument in science, the relation between theory and practice, and the degree of social construction in science, a major bone of contention between philosophers and sociologists. Let us look at these issues in order. Philosophers since Aristotle have talked about the role of logic in science, and Aristotle in particular focused on the relationship between demonstration and knowledge. Modern symbolic logic became the interpretive tool of choice for the logical positivist school of philosophy of science during the middle of the twentieth century. But these discussions, with their narrow focus on the analysis of the role of single-or select-arguments, miss a crucial, quotidian aspect of argument in science. Scientists live and breathe-indeed, their intellectual lives are constantly bathed in-argument. While it goes too far, the claim by some rhetoricians that the practice of science is itself a rhetorical activity gets at something essential about science (Harris 1997, xv). Unfortunately, the constant and essential argumentative activity of scientists has not seen much analysis by philosophers until now. But such analysis is called for, since, in the end, according to the philosopher, the relation between scientists and their beliefs ought not be based on arbitrary or whimsical choices but upon principled, argued reasons, whether the scientists are adhering to a theory (Franklin 1990, 487) or supplanting one theory with another (Burian 1990, 167). Exhibiting the central place of argument in scientific belief is particularly important in light of claims by sociologists of science, especially members of the "strong" program such as David Bloor and Barry Barnes, that "change in the content of scientific knowledge is to be explained or understood in terms of the social and/or cognitive interests of the scientists involved" (Franklin 1990, 487). Only close analysis of actual scientific argument will reveal whether or not the sociologists are correct. Here three intense extended arguments are examined in detail: the seven-year controversy over whether phylloxera was the cause of the vine disease or was only its effect; Prosper Gervais' four-year campaign against the américanistes, those scientists who believed that saving France from the phylloxera would necessarily involve the use of American grapevines; and, finally, the several-year-long dispute during which Alexis Millardet tried to persuade his fellow scientists, vignerons, and landholders of the efficacy of Vitis berlandieri grapevines from the alkali regions of Texas as rootstocks for use in the limestone regions of France. Each of these extended periods of argumentation is explored in minute detail, at some points on a day-by-day basis, revealing the exchanges between members of the various factions in the debate and evaluating their contributions to the argument. As we shall see, contrary to what the sociologists claim, argument based on evidence-observation, experiment, practice-overwhelmingly marks the conclusions of the examined controversies. A second point of interest to historians, philosophers, and sociologists of science in the phylloxera case is the role of the interaction between theory and practice. This modality of the scientific enterprise is not well known and not studied sufficiently. Studying the phylloxera case will reveal some crucial features of the theory/practice interaction. At some moments in the ongoing battle between humans and bug, theory led practice; at other times, theory misled practice. At still other times, low-level generalizations and even generalized observations led practice, which in turn created and/or corrected theory. Experiment, an element of practice, demonstrates similarly complicated interaction with theory. As Alan Franklin notes, "Typically, the interaction seems to be rather complex. Experiment may confirm or refute a theory or call for a new theory. Theory may suggest new experiments, offer a new interpretation of known results, or help to validate an experimental result. These are, of course, not the only possibilities" (Franklin 1986, 163). But even though there are no easy generalizations (other than that the interaction between theory and practice is complex), some of the features revealed will be important. For example, as some theorists of science have maintained, it is always possible for a scientist to support a pet theory, no matter the evidence against it, as did Guérin-Méneville, who held the phylloxera-effect theory until his death (de Ceris 1873, 674). To these interactions, two more elements must be added. First is the key role played in the phylloxera case by what can only be termed serendipity. One notable example was Faucon noticing in 1868 that when his previously flooded land emerged into the sun, the bugs were in remission. It was chance that his vineyard sector was flooded, but skill that allowed Faucon to make this observation. A similar case occurred in 1869, when the Phylloxera Commission was investigating the situation in Bordeaux and made the salient observation that Grenache vines-the variety most susceptible to phylloxera-growing in very sandy soil were healthy while those around them were sick and dying. It was good fortune that the commission decided at the last minute to go that way, but good science that resulted in the observation being made. In another example, how lucky was it that Laliman's American vines were interplanted with vinifera, allowing him to compare the different states of health in the same location? An important element of science, this: as Pasteur noted, chance favors the prepared mind. Second, the fitful progress attained during the interaction between theory and practice differs from the fairly smooth, uninterrupted progress in the technological realm. Theories, on the one hand, "are revised, rejected, overthrown," and "the process is not cumulative, since former beliefs may be readily abandoned in the light of new evidence or better theories" (Pearce and Pearce 1989, 407). Certainly this is what happened when the Montpellierian phylloxera-cause theory (the view that the phylloxera was the cause of the disease) overthrew the established phylloxera-effect theory (the view that the phylloxera arrived only after an unknown disease had sickened the vines). Once the prevailing theory shifted, beliefs and practices entrained by the previous theory were abandoned. This is not what generally happens with technological progress. As Pearce and Peace (1989) write, "By contrast, technological knowledge is basically cumulative in the sense that successful technologies are not subsequently open to 'refutation' as being 'mistaken,' though they may well become superseded through innovative change" (407). Response to the phylloxera crisis required the development of a number of parallel technologies. For example, methods of deep fertilization developed under the phylloxera-effect theory during early stages of the debate were retained after the triumph of the phylloxera-cause theory. Even though their origin was in a now-discredited theory, these methods worked, and were thus retained. Other examples abound. For example, techniques of immersion and sand planting resulted in constant improvement during the thirty years following their initial discovery. In another example, the growth and training requirements of American varieties were unknown at the beginning of the crisis, and, as all interested parties discovered, were quite different from the requirements of traditional varieties. Solving these problems was essential before efficient use could be made of the Americans vines either as direct producers or as rootstocks. In many cases, cooperation with American wine people assisted development, but some problems, such as the propagation of V. aestivalis varieties for wine production, or V. berlandieri varieties for rootstocks, proved intractable. Similarly, in another area, techniques, processes, and equipment for grafting needed development; in this case, aside from some minor borrowing of technique from early experience in grafting fruit trees, technological knowledge about grafting started at zero. On another front, once CS2 had been isolated as a useful insecticide, an entire industry-from raw inputs to nationwide distribution to end-user equipment and techniques-had to be developed from the ground up. And, finally, traditional viticultural practices underwent massive changes as vignerons had to learn how to plant, manage, and, most importantly, protect by spraying the new grafted-type vines, thereby developing what came to be called the "new viticulture." What is evident everywhere in all this is the extreme fluidity of the territory between theory, practice, and technology. Over the thirty years of war against the bug, a rich record of genuine science was graven in the minds of the participants, and, luckily for us, printed in all manner of texts. We will examine this record in detail, thereby providing a record of our own about how science in a crisis is done, paying particular attention to interactions among theory, practice (including experiment), and technology. This brings us to the last of our three main topics. Philosophers and sociologists of science have wrangled many times over the question of how much of science is "constructed," that is, invented by the scientist's imagination rather than discovered by the scientist's observation. Sociologists have long claimed that much of theoretical science is socially constructed, in other words, invented by scientists according to their interests, theoretical commitments, institutional constraints, and other factors. The best-known sociological case studies of science focus upon examples in which two or more theoretical possibilities conflict with one another, with the sociologists arguing that, ultimately, scientists' choices among competing theories are made according to what is socially determining, not what is actually present in the world. Most of these case studies concern subatomic particles. The poster child of constructionist theory is Andrew Pickering's (1984) study of the quark; a similarly admired work is Trevor Pinch's (1986) case study of solar neutrino detection. The phylloxera case provides an excellent example for philosophers and sociologists to study. Right at the beginning, the phylloxera disease entered a scientific world split quite unevenly between an established theory (the phylloxera-effect view, held by a very powerful scientific elite) and a novel theory (the phylloxera-cause view, held by a very small and unempowered minority community). From the moment the bug was discovered on the roots of some grapevines in an unimportant Rhône Valley vineyard, these two communities battled over whose version of the bug's role was appropriate. Things could not have been set up better for the social constructionist view of science. Admittedly, the situation is remarkable. It is a genuine case of two groups of theorists looking at exactly the same phenomenon and seeing two completely different things. The phenomenon itself is nearly microscopic, so it requires careful scrutiny to see what is going on, namely, the bugs eating the vine's roots. But, this having been observed, the question remains: what is actually going on? Are the bugs causing the disease? Or are they only responding parasitically to sick and dying vines? According to social constructionist theory, the dominant community, with its stronger interests, more powerful connections, and tighter institutions, should be able to impose its theoretical world upon the much weaker minority community. According to philosophers, however, the decision by scientists about which of the two theories to accept should depend not upon social forces, but rather upon what the scientists actually found to be the case in the world. Who is right, sociologist or philosopher? We shall see! This marvelous case is now ready to be laid out for the examination of all. Dying on the Vine chronicles 150 years of scientific warfare against the grapevine’s worst enemy: phylloxera. 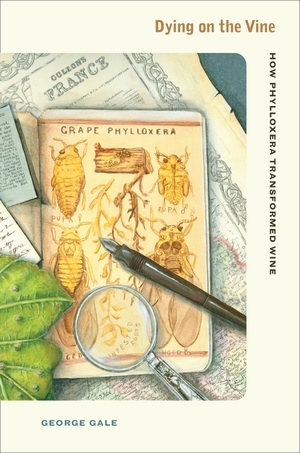 In a book that is highly relevant for the wine industry today, George Gale describes the biological and economic disaster that unfolded when a tiny, root-sucking insect invaded the south of France in the 1860s, spread throughout Europe, and journeyed across oceans to Africa, South America, Australia, and California—laying waste to vineyards wherever it landed. He tells how scientists, viticulturalists, researchers, and others came together to save the world’s vineyards and, with years of observation and research, developed a strategy of resistance. Among other topics, the book discusses phylloxera as an important case study of how one invasive species can colonize new habitats and examines California’s past and present problems with it. George Gale is Professor of Philosophy at the University of Missouri-Kansas City and the author of Theory of Science. He has written about phylloxera for The World of Fine Wine magazine and other publications.